Hello stamping friends! Here is another great challenge from the sweet ladies over at Stampin Royalty. This week the challenge is to create something with Sparkle and Shine. Nothing says bling like Gold! I love using it! And with our new Gold Wink of Stella pens it is super easy to get that sparkle and shine on any project. My flower was watercolored using ink from the lid of the pad and a blender pen. The few outer edge highlights were added with the Wink of Stella and the inner flower is Wink of Stella as well. 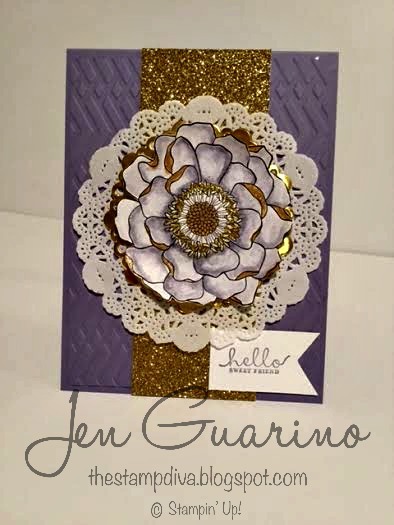 It has been so much fun to be a part of the team at Stampin’ Royalty! I have enjoyed my time with them and being a Stampin’ Goddess has been a blast! Next > ICS Blog Hop Welcome Spring!